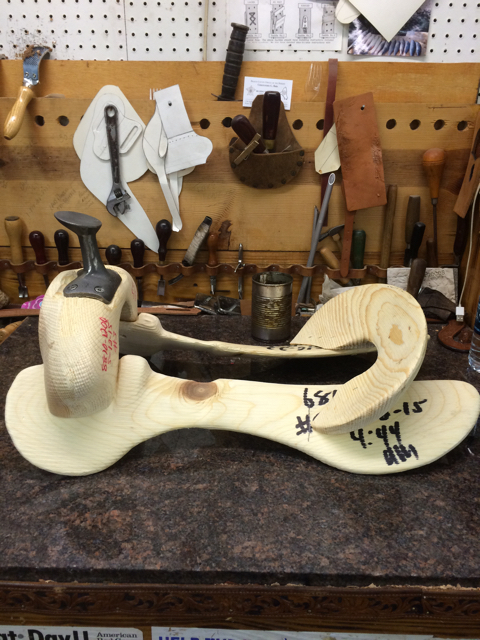 Here is a quick run down of what projects are in process within the custom saddle department of our shop (this department consisting of Jim and I, ha ha): we have four customers’ orders from our list, each different and uniquely complex, two ranch saddles for the All Around Performance Horse crew (due in two weeks), and all fourteen of the Big Loop saddles. This is all happening at the same time that the rest of the shop is busy on multiple belts, wallets, scabbards, holsters, saddle repairs and handling customers on a daily basis. The oppurtunity for chaos is so great that it makes for an exciting work week this time of year. had been started already, some ground seats were done and I wanted to get them all done completely so that Jim could focus on getting the All Around saddles to a point where I could get to tooling fronts or swells (my favorite… not). Starting Monday with that goal in mind, I made progress and got all the ground seats completed by the end of the week. Since this is usually the part that Jim takes care of, I was sure to check with him off and on to insure that I was putting the ground seats in the way he had been doing them. It took me a couple times and a bit of Jim giving me hell, but in the end I got them all in. Even though Jim and I both build saddles, we each do things a little different and consistency is what we want especially with this project. For the last couple years, our partnership on saddle making has been him building and me tooling/designing all the artwork. He is much faster than me at building and I am much faster than him at tooling, so this arrangement works well. Since these are all rough out, and there is fourteen of them, I have to help him with a lot of the building and keeping up with changes he has made all year is something I have to be mindful of. Even though my name is on the sign and stamp, Jim has the lead on this project… And I think he takes a little pleasure in bossing me around. As the week went along uneventful and productively, it didn’t start off that great. By Monday afternoon we were met with 85 degree temperatures in the shop. Our air conditioner was froze up and not cooling at all. Thinking back on the last few weeks, we realized that the filters hadn’t been changed and they really needed it. In a shop like ours the dust can get pretty bad due to the sanding from the finisher so we have to change filters every two weeks or so. It wasn’t till Tuesday afternoon late when our AC repair guys got us back up and running… till then we just tried not to drip sweat on the leather. Which tree style would fit my horse better? These days many items are made overseas, bringing with that lower cost and bigger selections for American consumers. No matter your opinion of this issue, continued import of overseas manufactured items is here to stay and for the most part accepted by consumers. Even the saddle industry is experiencing this and when it comes to some items the quality is reasonable for the cost. When it comes to saddles, consumers should really be cautious. For years Americans have purchased saddles that have been imported from Mexico for an inexpensive alternative to the American made counterparts. With a few exceptions, these saddles have been marked with the stigma of low quality and at times structurally unsafe. No matter the stigma, many people trying to save a buck purchase these saddles anyway and deal with frequent repairs and saddle fitting issues. With any luck they aren’t injured due to the saddles less than adequate structural integrity. The newest addition to this “value based” saddle market is saddles imported from countries like India. In the saddle shop we have run across these on a semi frequent basis and the quality is worse than usual. Many folks are buying these saddles on the internet and eBay and although they may look decent in the photos, when they arrive it is immediately seen that they are less than functional. I have seen these saddles with no rigging dees at all, making them impossible to actually use on a horse. We have seen them with synthetic leather and trees, plastic rigging dees and a number of other issues that make these saddles dangerous to use. The most recent experience that we have had the pleasure to work on in the repair shop was a true gem of the import saddle industry. The saddle came in for an offside front rigging dee replacement. This is a job that is very common and not very expensive to fix. When the saddle was broken down in the repair room, the repair man confronted me with an issue. He told me that the rigging couldn’t be fixed and that I should look at the tree with him. Looking at the tree bar at first I didn’t understand what the problem was. It was a fiberglass tree bar with holes in it where the original rigging screws use to be, this was nothing out of the ordinary. The saddle really didn’t appear to be a bad built saddle. It was a training saddle with rawhide mounted dees on the corners of the skirts for driving lines, rawhide trimmed horn, padded seat and good color. I asked my repair man what the issue was and he proceeded to show me the problem. He took a screw and stuck it in one of the existing screw holes and then moved it at different angles from side to side. Yes, that’s right! The entire tree bar was a hollow fiberglass shell. It looked like a wooden bar covered with fiberglass, but in reality it was an empty fiberglass bar… no wood at all. Think of it as an empty egg! The entire saddle was like this, both bars and swells even the cantle. This was unbelievable! I have never seen anything like this before and couldn’t believe that someone had been riding this saddle and they weren’t hurt. With further inspection we also discovered that all the rawhide holding the accessory dees on and the binding around the horn wasn’t rawhide at all. The dees were mounted with nylon webbing and masking tape was stuck over the top. The horn binding was just masking tape. Unbelievable! At that point we called the customer and told them that we would not fix the saddle and warned them of the danger involved in using the saddle. All I can say is that I hope everyone keeps their eyes open for these types of saddles. It’s one thing to by a cheap pair of “Oakeys” or “Raye Bans”, but putting your life on the line with this inferior garbage being imported into the states from countries that have no knowledge of what these saddles go through in our country is extremely dangerous. Remember that a custom saddle has at least $1000.00 in material in it, so when you’re looking online and you find a new saddle on eBay for $300, beware. The retree is almost over, at least for the hard part. Once the swell cover and cantle back are put back on the seat is installed. This is where we see how well we did so far. If all is well, then the seat should fall right in and even match up with the old wear marks around the swell cover. The seat is pinned in place around the front so we are sure it is where it should be while we glue it in. We glue the rear of the seat first with two coats of glue. If we are right the seat should line up with the cantle plugs at the back of the Cheyenne roll and be even. If you have a little difference here you can sand off to even it up. Once the back of the seat is glued down then we move onto the binder. Most of the time the binder is destroyed during it’s removal, here we got lucky and were able to use the old one. I prefer this because it makes the saddle look more original when completed. The less new leather you have to use the better the job finishes out. My motto with repair is do your best to cover your tracts so that it looks like you were never there. On this particular project we had to make some compromises in sewing the binder. I usually like to always stitch back in the old holes, but with the age on this saddle we couldn’t do that for the new stitches tearing through. My fix for this issue was to stitch through every other hole, with as close as the holes were to start it worked out well and looked fine. Last to do here is glue down the front of the seat (with two coats). The hardest part of this job is completed now and all the parts are ready to be washed and oiled. This is done no different than a normal clean, oil, and polish. I do this to all the retrees that I do to insure that it gets a good oiling and looks great for the customer. Here you can see that the saddle is complete and ready to be put back to work. Aside from the new horn the saddle looks no different than when it first came to us, except being cleaner… And now the tree isn’t broke. Let us know what your thoughts are on putting a tree in a saddle. I do probably two a year, and I credit that to me trying to talk folks out of them. But for some situations it is worth the money, and for this customer it was well worth it! He was glad to have his rig back to work out of. No matter how careful you are when taking the saddle apart, putting a new tree in a saddle can still be a very difficult process. Here we have cleaned up the original rigging of this saddle and installed it on to the repaired tree. This is where I don’t worry so much about putting them back EXACTLY where they were to begin with. With this particular saddle, age and use has probably stretched the rigging somewhat out of alignment and proper alignment of the rigging insures the saddle rides square on the horse. For this reason, I install the riggings without paying attention to where they were and instead putting them where they should go. Sometimes you have to accept a little difference to get there but not enough that will affect the rest of the job. Once I have the rigging installed I move on to the ground work. Luckily with this saddle we were able to utilize the ground work completely which saves some time. Each piece is installed just as it was when the saddle was first made. The great thing here is that all other parts will fit as original (seat, cantle back, plugs, and so on). On the occasion where these pieces can’t be used, you would install the groundwork as in a new saddle keeping in mind the way the old seat and such will fit with what your trying to recreate. This adds lots of time and labor. After all this is completed, the cantle back and front should drop right in place and with the help of glue and elbow grease you are ready to put the seat in. Occasionally when putting the front on, you will notice a difference in the horn hole thanks to the new horn cover. Everyone covers horns different and the original may have been thinker or thinner at the base. My suggestion here is to cut it bigger if it’s too tight (which is better) and if it’s too big, your only hope is that the glue will help to hold down the slack around the base. The next post we will visit about installing the seat and binder which gets us to the point of washing and final assembly.